The bar serves very delicious food. 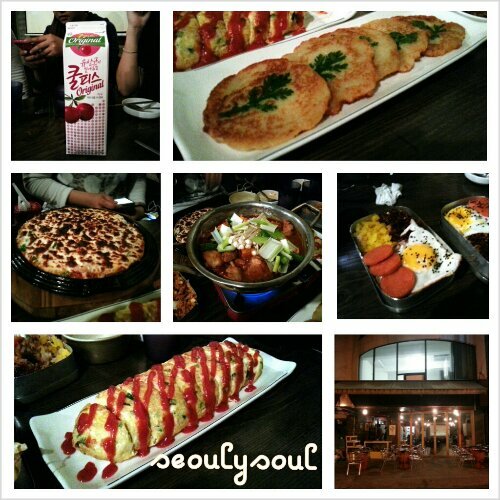 The 6 of us shared a potato stew, egg roll, pancake and korean lunch box set. Try the peach juice drink... delicious too! To get there, take subway to Apgujeong rodeo station and use exit 5. While facing the main road, turn right and walk towards a Canon building, Soju Tec and Toms and Tom Coffee. Continue to walk straight and you should see standard chartered bank and paris baguette. At the next junction where you see the flower cafe, du sel brilliant, turn right and continue walking straight. When you see Look Optical, walk straight. At the T-junction, turn right. Gaepan is just around the corner. The restaurant opens from 7pm till wee hours in the morning. "I really am impressed with how much you have worked to make this website so enjoyable. Thanks a lot for your effort. Many thanks to the person who made this post, this was very informative for me. Please continue this awesome work."